A new archer comes to Starling City as Team Arrow deals with a death in the family. Death is a natural part of any superhero story. It’s something every hero must deal with, and no one knows that better than Oliver, who has watched his best friend and mother die in the past two years. In the wake of those deaths, Oliver lost confidence in his mission and sought isolation from the world to grieve alone. Thankfully, tonight’s episode does not retread old plot points, and, instead, we start to see how Sara’s death will force our characters to make decisions about what they want their lives to be. While, “Sara” might not be as poignant as last season’s “City of Blood,” it still does a decent job of handling Sara’s death. The episode opens with Oliver, Felicity, and Roy are arguing about something as they enter the Arrow Cave, but their conversation is interrupted when they find Laurel standing over Sara’s dead body on the table. Because of Sara’s vigilante alter-ego, Laurel didn’t know where else to go and couldn’t stand to leave Sara’s body lying in the street, so she brought it to Verdant. Everyone reacts as you’d expect: Felicity starts rambling, while Oliver and Roy remain silent. It’s easy to understand just how upset Laurel is: She’s grieved for her sister once already, and when she came back to life, she didn’t expect to go through this again. She tells Oliver that the first time Sara “died,” she didn’t have an outlet through which to channel her rage, but now she does: finding Sara’s killer.When Laurel tells Oliver that a bar, like Verdant, is the last place she should be, it’s clear just how far she’s come since last year’s season premiere. Like Oliver, she did not take Tommy’s death well and used alcohol and drugs to numb the pain. Oliver tells her to focus on taking care of her family and to leave finding Sara’s killer up to him. Because of Quentin’s weak heart, Laurel decides that she’ll tell him about Sara when they’ve found her killer. The death of Laurel’s sister also highlights someone else who’s missing from the show: Thea. Her absence was felt more tonight than it was in the premiere, mostly because Oliver calls her several times, seeking the comfort of hearing her voice, but receives no response. To distract himself from his grief, Oliver gets right to work and goes to check out the roof where Sara died. He quickly recreates her death in his mind and figures out where the archer was standing. Diggle shows up to lend some emotional support, but their conversation is cut short when Captain Lance calls asking for the Arrow’s help, re: there’s a new archer in town. Team Arrow believe they’ve found their guy. Unfortunately, Oliver has no idea who this archer could be because all of the ones capable of doing this are in the League of Assassins, and he doesn’t think they would’ve killed one of their own. He asks Diggle to use A.R.G.U.S’ database to draw up a list of potential archers. Elsewhere, this new archer in town, who we later find out is Simon Lacroix, also know as Komodo, takes out another target. Back at the lair, Felicity walks in on Roy hacking into the FBI database to locate Thea because he doesn’t think she’s where she says he is based on a letter she left him during the siege. (Um, when did Roy learn hacking skills?) He shows Felicity the letter, and she insists that he show it to Oliver, who is obviously upset that he hasn’t heard back from Thea. Their conversation is cut short when she receives a text that pisses her off, and she leaves to go kill someone. And who might that someone be? You guessed it, Ray Palmer. Turns out Ray, whose charm makes it so hard to hate him, bought the company that owns the electronics store chain for which Felicity works. He gives her two options: either work for him in that horrible uniform, or come work for him at Queen Consolidated. Because Felicity isn’t like most women and is not flattered that Ray spent so much money on her, Felicity chooses option C and quits her job at the electronic store and proceeds to storm off. In his first human moment since his first appearance, Ray points out that Felicity is obviously taking her anger about something else out on him and tries to comfort her. And while merely reminding her that “it gets better” is a rather lame response, it’s the thought that counts, and it definitely leaves an impression on Felicity. 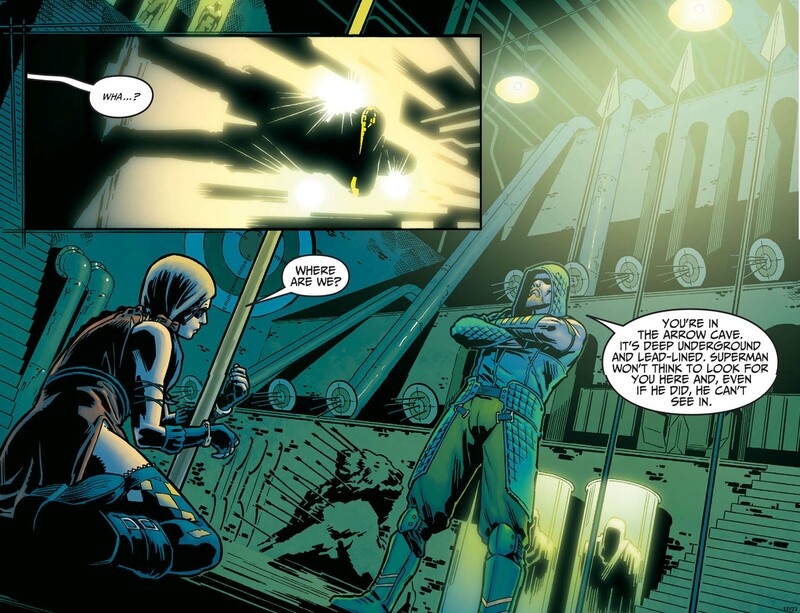 Using a description Oliver got from a witness, Diggle is able to use A.R.G.U.S’ database to narrow the list of potential assassin archers down to one: Komodo. With a name, Felicity is able to track Komodo’s burner phone and finds out that he’s on the move now. Oliver hops on his motorcycle and speeds off to find Komodo, who is about to kill another target. Oliver arrives in time to stop him, but in the ensuing motorcycle chase and game of chicken, Komodo knocks Oliver off his bike and manages to escape. At the lair, Felicity starts using several government databases to find a link between Lacroix’s targets. Oliver, who’s been using tracking Sara’s killer as a way to escape grieving, hates waiting around and gives Felicity a hard time because her search is taking so long. Felicity says she’s doing the best she can given the fact that one of their friends died and her body is being stored in a freezer above them (because they have no idea what to do with it). She also can’t understand how Oliver can be so cold and rational, and she starts to say that things could’ve worked out between them if he’d allowed himself to feel more, but she stops herself because this is about Sara, not them. Oliver says he doesn’t have the luxury of grieving because everyone is looking to him to lead. The problem with his defense is that the past two times someone has died, he did the complete opposite of leading. Although his decision to actually hang around shows some emotional growth on his part, it’s still problematic because he’s not allowing himself to grieve and is pushing those closest to him, like Felicity, away. Sara’s death is such an important death because it is the first time that one of the heroes has died on this show. This really puts things in perspective for most of Team Arrow, but especially Ollie. He admits to Felicity that Sara’s death has made him realize that because of the life he’s chosen for himself, he’ll probably die in that cave. Felicity, however, is not willing to sit around Verdant waiting for Ollie to die because Sara’s death has reminded her that there’s so much more she wants out of life. Meanwhile Laurel, who’s not willing to sit and wait for Felicity’s computer to works her magic, goes to the hospital, lies her way past some police officers and proceeds to interrogate the man Oliver saved from Lacroix. Remember earlier when she said she was going to channel her rage into finding Sara’s killer? Well, she wasn’t lying. When he isn’t forthcoming, Laurel proceeds to twist his injured arm until he confesses that he and Lacroix’s other victims were working on a pipeline deal for AmerTek that no one was supposed to know about. His confession, unfortunately, is cut short by one Lacroix’s arrows. With the information Laurel coerced out of the guy, Felicity is able to figure out Lacroix’s next target and that the oil pipeline is located in the fictional Middle Eastern country Qurac, which is where Sara once “worked” a job. Laurel, who tries to borrow a gun from the armory, insists on accompanying Oliver to take down Lacroix, but Oliver says no. Lacroix’s final target is attending a party Ray Palmer is throwing at Queen Consolidated, and Lacroix makes his move right after Ray finishes his speech to the potential investors. Oliver and Roy show up and start fighting Lacroix, but he escapes to a lower floor. Oliver follows, and after a brief game of hide-and-seek, the two archers come face to face, bows at the ready. They both shoot, both miss, but Lacroix quickly reloads and fires again, but Oliver catches the arrow, does this cool spin move and fires it back at Lacroix. It’s at that moment that Laurel shows up with a gun and demands to know why he killed her sister. To everyone’s surprise, however, Lacroix has no idea what she’s talking about and says that he was in Blüdhaven on the night of her death and couldn’t have killed Sara. Oliver continually pleads with her to put the gun down. Laurel doesn’t believe Lacroix and actually pulls the trigger, but it’s empty because Ollie removed the bullets. After Oliver confirms Lacroix’s alibi, he tells Laurel that she needs to tell her father about Sara’s death. She goes to the precinct to do just that, but stops when Quentin’s heart monitor goes off reminding him to take his pills. She’s worried that his heart won’t be able to handle it. That night, Team Arrow meet at the grave that was made when Sara disappeared all those years ago, and finally put a body in the casket. It’s a fittingly underwritten scene, which allows for the silence to speak for itself. I mean, there have been very few quiet moments on tonight’s episode. Laurel says it’s not fair that Sara died without anyone ever knowing who she really was, which clearly moves Oliver and causes him to think about his future. Diggle says that they will never forget her because he and Lyla have decided to name their baby after Sara. It’s an admittedly cheesy move on the writers’ part, but it does feel rather earned. Even later that night, Diggle returns to the lair to find Oliver sulking. He says he’s rejoining Team Arrow to help Oliver find Sara’s killer. As he’s getting ready to leave, Oliver tells Diggle that he doesn’t want to die down there, to which Diggle plainly says “So don’t, Oliver.” This gets at the season’s theme of “identity.” Oliver has a chance to define who he wants to be and what he wants to get out of life. He can either continue to emotionally seal himself off from those who love him or he can let them in and have a more fruitful life and not die alone. We see that Felicity has made her choice and takes Ray up on his job offer. The episode ends with us finally checking in on Thea in Corto Maltese, where she’s shown taking out two of her sparring partners and making her daddy proud. Amanda Waller is still threatening the life of Maseo’s family to ensure Oliver’s cooperation because she’s determined to turn him into one of her operatives for an unspecified mission. This week’s flashbacks begin with Maseo on a roof preparing Oliver to assassinate a target with a sniper rifle. It’s never made clear when Ollie learned how to use a sniper rifle, but whatever. Oliver gets ready to take his shot as his target starts walking across the terrace of a hotel. As the target turns around, Oliver sees it’s Tommy. During Oliver’s escape attempt, he logged onto his email, which drew Tommy to Hong Kong because he thought it meant his friend was still alive. Waller’s worried that Tommy showing Ollie’s photo around the city will blow his cover and she won’t be able to use him as an operative. Refusing to kill his friend, Ollie and Maseo kidnap Tommy. Ollie tells Tommy that Oliver Queen is dead and that he logged onto his email to draw someone to Hong Kong to extort money. However, the “police,” a.k.a. Maseo, show up before Oliver can get his ransom. — The introduction of Komodo hints that Arrow might be borrowing from material from Jeff Lemire’s recently ended run on Green Arrow. Do yourselves a favor and pick up the two latest collected editions: “Volume 4: The Killing Machine” and “Volume 5: The Outsiders.” You can skip the first 16 issues of the new Green Arrow series because it doesn’t start getting good until Issue 17, which is where Vol. 4 starts. — This probably won’t be the last time we see Komodo. When news broke that he would make an appearance this season, EP Andrew Kreisberg said that Komodo would tie into the season-long mythology. — A poster for The Flash released a few weeks back hinted at the introduction of AmerTek into the Arrow/The Flash universe. Wonder how long it will take until we meet John Henry Irons, a.k.a. Steel. — Who do you think killed Sara? I thought it was Thea, which seemed to be confirmed by a Reddit user, but the final scene kind of ruled that out. Sound off in the comments with your own theories!